Today's post is definitely for the geekier among us (err... anyone serious about drinking wine on planes). The elite status qualification systems on the big legacy U.S. airlines (American, Delta, and United) have become excruciatingly complicated over the last several years. Nonetheless, I still maintain that earning your way into a higher privilege tier nets worthy benefits in terms of better seats, free checked baggage, an overall kinder and gentler airline experience, and other perks that come along (such as access to the quite-nice Iberia lounge in Madrid that my American Airlines Platinum membership resulted in several weeks ago). These are mostly marginal gains, but they do make travel a bit easier. 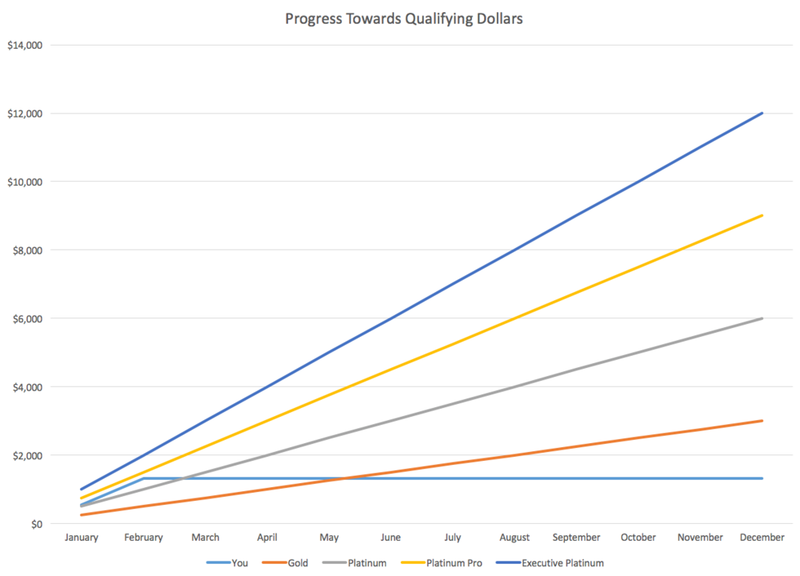 The different combinations of miles, segments, and dollars spent that are needed to earn better perks when you fly have made it tough to know throughout the year whether you're on track to earn or keep the status you want. Just last year, American (on which I most frequently fly, living 5 minutes from one of their hubs and such) changed the system through which one qualifies for various AAdvantage status tiers to require a certain number of miles or flight segments flown, plus a certain number of dollars spent. I figured out that I needed to rack up either 50,000 eligible miles or 60 actual flights while simultaneously spending $6,000 this year in order to keep my Platinum status through 2018. There's a lot of voodoo that goes into each airline's calculations of which miles and dollars actually count towards these goal posts, but suffice it to say the app or the the airline website tells me how many I've accumulated year-to-date at any given time. The next question is easily determining whether I am on track, and which level of status I'm on track to make at year's end (who knows, maybe I'll luck out and pull in the next level higher, right?). So I built a spreadsheet into which I just have to plug my year to date totals at the end of each month, and then Excel does the rest of the math for me. 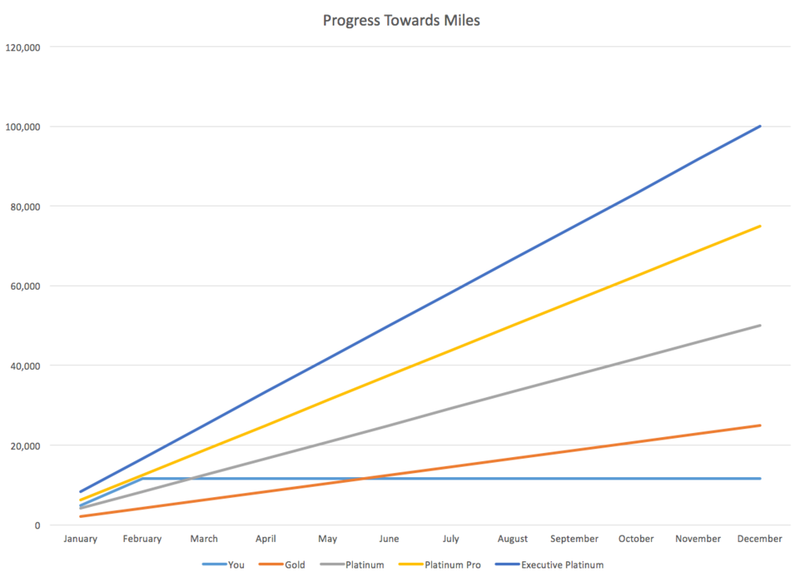 It even gives me handy visuals that show how I am doing compared with where I need to be for each level of status each month in order to trend towards the finish line, and tells me where I'd be at year's end if I just stopped traveling today. As you can see from the screenshots below, I'm generally trending towards finishing with more than I need for platinum, but less than I need for platinum pro (which, of course, would leave me with platinum status). Every month that I enter numbers, my light blue line will slope upwards and then continue leveling off the rest of the year to show me where I'd be if I didn't take another flight the rest of 2017. All I have to do at the end of each month now is look in my app, and then enter three numbers in the "Your End-of-Month Totals" table on the first sheet. I've made this really easy for you to track your progress throughout the year. Download the Microsoft Excel file for the airline you want from the list below. Remember to only mess with the Dollars, Miles, and Segments columns in the "Your End-of-Month Totals", or otherwise risk changing the rest of the logic that goes into building this thing for you. As I said up front, there's some geekery here, but I'm confident this will make it easier for you to see where you are vs. where you should be throughout the year. Enjoy your travels!